Back in the day, when I was a freshman in high school, I abandoned the flute for a short while to play clarinet for a season. It was one of my biggest mistakes as a newbie in high school (because I sucked at clarinet and desperately missed my flute) but it was also one of the most fun times in my life. I had switched to clarinet with one of my best friends and we were the biggest slackers when it came to learning how to play, or more accurately fake play. 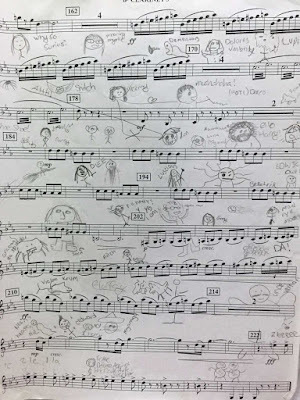 When we weren’t skipping band class under the guise of learning the new instrument, we were doodling all over the music. And of course, being the nerdy teenagers that we were, we doodled Harry Potter characters and inside jokes from the series all over the music. I remember us taking turns drawing something and then laughing hysterically over it. We would try our best to stifle our laughter because we were in class and our band director was trying to teach, but we were incredibly loud. I look back now and cringe, thinking about how obnoxious we must have been. If I was a senior in that band class, I would’ve most definitely hated us lol. My friend and I used to be threatened all the time to be separated because we were so “disruptive” but did that stop us? No! Towards the end of the year, I believe it was actually during the senior graduation, the music librarians were walking around collecting music and my friend and I were freaking out because our music was completely WRECKED with Harry Potter doodles. The librarian took one look at our music and stormed off with a disgusted look on her face. My friend has kept the music to this day. Harry Potter made my freshman year in band amazing, and it also introduced me to one of my best friends. Thanks, JKR! 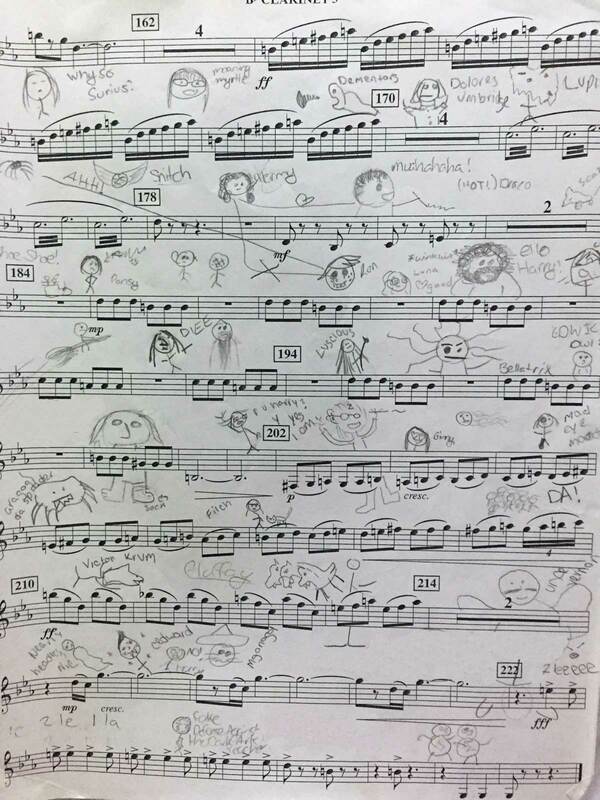 That sheet music is amazing! I especially love your Fluffy and whisker-faced MaGonagall. I was like that too, I doodled all the time and it was pretty much exclusively Harry Potter. You've inspired me to dig out my old doodles. Hopefully, I can find them. WOW That is hilarious!! My favorite would have to be Bellatrix and Fluffy. 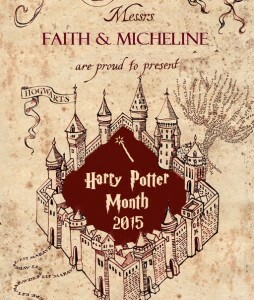 I wasn't in school when I read HP, but I was a big doodler so I imagine I would have been the same way. Actually, I took so many art classes, most of my pieces would've probably been HP themed as well LOL. Thanks so much for sharing this! I got a good laugh out of the cute doodles. Yeah, the Bellatrix doodle is one of my favorites too, lol! I never really got the chance to take art class but I remember being extremely jealous of my sister when she took pottery class. She would always be creating something Disney themed or something related to the her favorite band, The Beatles. You girls are so naughty! Although I can't blame you, I'm a doodler too... although mine was during Math class... oops! Lol, it's probably not a Blast-Ended Skrewt, our doodles just got a little messy. That's so awesome that you guys doodled Doctor Who! Haha, yeah, fandoms definitely bring people together. I really do cherish my childhood HP related memories. I can't imagine how different everything would have been if I hadn't discovered HP at the age that I did.